A friend of mine has a sister who is expecting twins this year!! How exciting!! 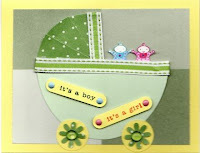 Here's my version of "It's a Boy" "It's a Girl"